Eat Out at Chelsea Market and Cafe! I asked my brother and cousin to join me in using my previously purchased Chelsea voucher. 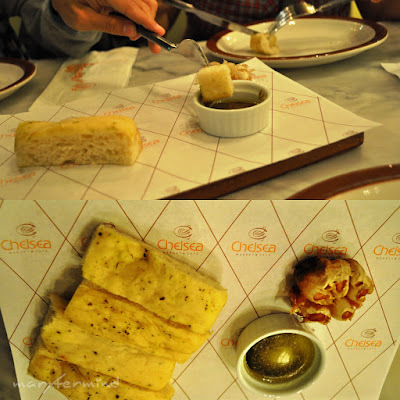 The voucher cost PHP 470 for PHP 1000 worth of food and drinks, and that is 53% off! Chelsea Market & Cafe is part of Raintree Restaurants, which also owns the MoMo Cafe, Mr. Jones, Museum Cafe to name a few. They have two branches, Serendra and The Podium Mall. The restaurant provides cozy and classy ambiance for diners. They serve fresh breads, pastries, and hard-to-find retail items. 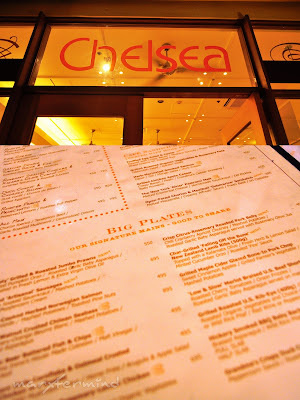 At Chelsea Market Café they only serve the best gourmet-comfort food in a chic homey atmosphere. While waiting for our orders, a free appetizer was served on our table. After we enjoyed our appetizer that finished for 5 minutes on our table, our food had arrived. We ordered 10″ pizza and pasta. The sauce is so creamy with bits of bacon on top of the pasta, yum! Next is Roasted Prawns and Prosciutto Pizza. This pizza cost PHP 495. 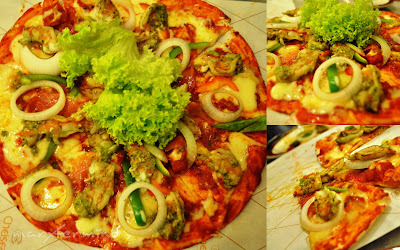 The 10″ thin crust pizza composed of roasted prawn, tomato sauce (I suppose), melted cheese, bell pepper, onion and lettuce, and sliced into 8. I love prawn but I haven’t enjoyed this much. I don’t like how it was cooked, which is roasted. It seems like it was still uncooked, tasted fishy (malansa). Too bad I don’t know that this was roasted prawn supposed to be. We wanted to order cakes for dessert but it was so expensive. Anyways, I still enjoyed our dining experience in Chelsea Market & Cafe. Next story Conti’s Cakes for Dessert! @Chyng, tama napapagastos ng wala sa oras ang mga coupons na yan! and so i thought perfect choice yung pizza nyo.. sayang..
sa greenwich din. yung favorite kong aglio olio nila, nabadtrip ako nung malansang prawn yung nilagay. asar! naspoil yung lunch ko. 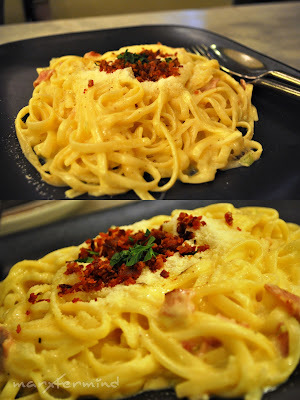 Hindi naman nakakaumay yung carbonara? yun kasi yung medyo ayoko sa maccreamy na pasta.